“Mine look like bananas!” I apologized. I was assured that, first of all, they did not look like bananas. And even if they did, who would care? Once they’d been boiled, smothered in sautéed onions, and served with a giant dollop of sour cream, they would taste amazing. It was late December, and Mom, my younger brothers, Aunt Mary, Uncle George, and I were gathered around our newspaper-covered kitchen table. Hands dusted with flour, we had each set up our individual work stations with the proper tools: a square of waxed paper, a communal canister of flour, and a narrow-mouthed cocktail olive jar, which would serve as a mini-rolling pin. When we finished our project, the olive jars would be returned to a corner of the pantry to await next year’s pierogi-making party. In the center of the table was a wet loaf of sticky sour-creamy dough, from which Mom cut small chunks to distribute to each of our work stations. We sprinkled flour onto our waxed paper and coated our olive jars with the same, and then we rolled the dough into something approximating a circle the size of a flattened tennis ball. We dropped a spoonful of filling—either the mashed potato and cheese concoction or my favorite, the sauerkraut, onion, and cottage cheese mixture—onto one side of the circle. Then we folded the dough over and sealed the filling inside by pressing our thumbs along the edges. Which may or may not resemble a banana. Growing up, the pierogi-making party was an annual ritual, an Advent tradition as familiar as candles and wreaths and “O Come, O Come, Emmanuel.” Our Christmas Eve dinner, or “Holy Supper,” followed the tradition of my father’s family, imported from his parents’ native Ukraine. It was a completely meatless meal, to follow the tradition of the Ukrainian Catholic Church. I think its original form involved multiple courses and a lot of symbolism—including straw under the tablecloth, to represent the baby Jesus’ manger birthplace. And raw garlic cloves served up like pickles or olives. The version of Holy Supper with which I grew up was significantly abridged. We skipped the straw and the raw garlic and served only two courses: kapusta (a sauerkraut and split pea soup, which looked and smelled as appetizing as it probably sounds) and pierogies. Both of these were topped with onions sautéed in a pound or more of butter and were accompanied by unleavened bread, stuck with cloves of garlic before it was baked, and served with generous drizzles of honey. The strong flavor of the garlicky honey bread is the only thing that made the kapusta even remotely appetizing to me. But I loved the pierogies. We would boil them on Christmas Eve, and for Christmas morning breakfast, we would fry up the leftovers in a skillet, along with the buttery onions. My mother grew up a decidedly White Anglo Saxon Protestant dairy farmer’s daughter, and she used to tell me that she never tasted garlic before she started dating my father. She was raised with a predictably bland meat and potatoes diet, but she grew to love the food of her eastern European in-laws. To my father’s delight, after a couple of false starts, she mastered how to prepare most of his childhood favorites. They often laughed about her first attempt at making halupki—or stuffed cabbage, or pigs-in-a-blanket, depending on your vernacular. She didn’t realize she had to steam the cabbage before rolling it around the ground beef and rice concoction, so she fastened the rolls together by securing them with toothpicks. We ate pierogies and kapusta on Christmas Eve, and on Easter, cold kielbasa and potato salad and hard boiled eggs dipped in a shredded beets and horseradish mixture. The one delicacy of my father’s childhood that my mother never attempted to prepare is studenina: jellied pigs’ feet. My Uncle Paul likes to joke that, “You can spend an hour convincing someone that you can make jello out of pigs’ feet, and then you blow it when you tell them that you pour vinegar over it and eat it for breakfast.” My dad loved it. I’ve never been able to bring myself to taste the stuff. When Mom first asked my grandmother for her pierogi recipe, Grandma shrugged. After decades of making pierogies every Friday, she cooked by instinct, not by measurement. So Mom followed her around the kitchen, writing down everything she did to prepare the dough and mix the fillings. 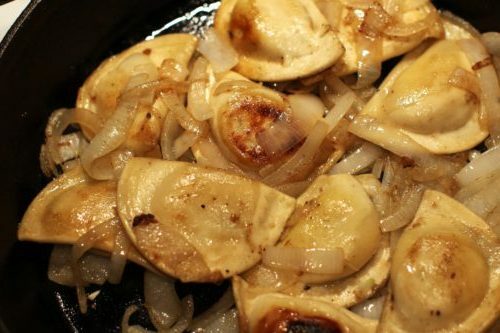 A pinch of this, a handful of that—with the end result enough pierogies for us to eat well that evening and for many meals to come. Our freezer would be well stocked for the twelve months that tended to lapse between pierogi-making parties. And we were following the steps my grandmother had followed week after week, when the “recipe” yielded only enough to feed my dad and his many brothers and sisters for a single meal. It continues to feed our souls. This entry was posted in Food & Place and tagged childhood, Christmas, cooking, food, Grandma, immigrants, memories, tradition, Ukraine. Bookmark the permalink. Now I want a perogi! My family has no “make this every year” tradition and I kind of feel the need to start one now. Love the insight that what is seen as a feast/treat – was really just survival when it started. This brought back so many wonderful memories. Thank you, Amy. Oh, Amy! What a perfect memory. We always comment on Christmas Eve that Holy Supper “is being served from coast to coast” by generations of Maczuzaks! Love you, sweet girl. I have a crystal clear mental picture of Grandma sitting at our kitchen table, covered by news paper, in Rodgers Manor making perfect pierogi after perfect pierogi. Her technique was so masterful, you would think she used a machine to make them that uniform in size and shape, but all I remember her using was a wide mouthed glass to cut out the circle of dough. She’d stay with us for a week, and we would have enough homemade pierogi for 6 months. I am now craving pierogies! You make it sound so easy, might become a new tradition for us as well. Thanks for sharing Amy, I have wonderful memories of Ukrainian soul food too. I think any culture with a “stuffed pie” type food has got it right. Yes, the result is delicious, but the process is almost more important. It’s a food that requires time and care (and several people if you want to make a lot!). 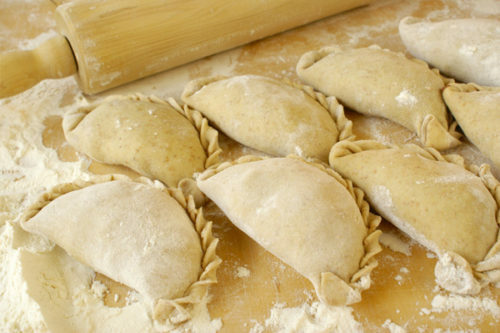 A Chinese friend once invited a group of us over to make (well, first we had to LEARN how to make) dumplings. I loved every minute—of the making and the eating.